A vinyl brick wall wrap is a special type of printed vinyl which adheres perfectly to brickwork. The vinyl can be printed with any design imaginable; this could be text, a solid colour, an image and so forth. The printed brick vinyl is loosely applied to the bare brick and with the use of a heat gun and foam roller it is firmly stuck into place. The finish with heat on brick wrap is truly remarkable, it appears that the brick has literally absorbed the vinyl, creating a vibrant image with a beautiful texture, reminiscent of a painted mural. Brick vinyl wall wrap can be applied to bare or painted brickwork on internal or external walls. Removal is straightforward and leaves no lasting residue, the vinyl must simply be heated and gently peeled away. What are Vinyl Brick Wall Wraps used for? Vinyl brick wall wraps can be used anywhere that brickwork is present, so the possibilities truly are endless. It is typically used for short to medium term applications to transform unused spaces and create new advertising opportunities. Printed brick vinyl is a great alternative to other types of signage when covering large exterior spaces. This is because it is a cost-effective material and it doesn’t require any permanent changes to the brickwork, i.e. drilling fixing holes. 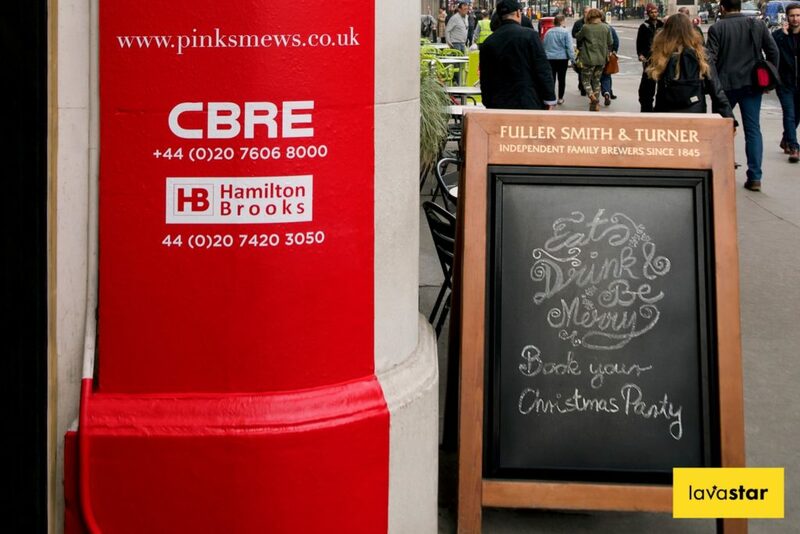 Some of the most common uses for brick vinyl wall wraps are; adding branding to an event venue, alternative advertising in city streets and branding shop or restaurant exteriors. Lavastar have abundant experience with heat on brick wrap. We offer a personalised and complete service to anyone looking for this type of wall wrap which includes design, print and installation. We can work with designs provided by you or appoint our team of creative graphic designers to create a selection from you to choose from. Once proofs are signed off, we print the brick vinyl in house using industry leading vinyls and inks to ensure the longest possible lifespan of your graphics. Our team of vinyl experts will then visit your site with all of the relevant equipment and install the vinyl brick wall wrap safely and efficiently, leaving you with beautifully wrapped brickwork and a job perfectly executed.